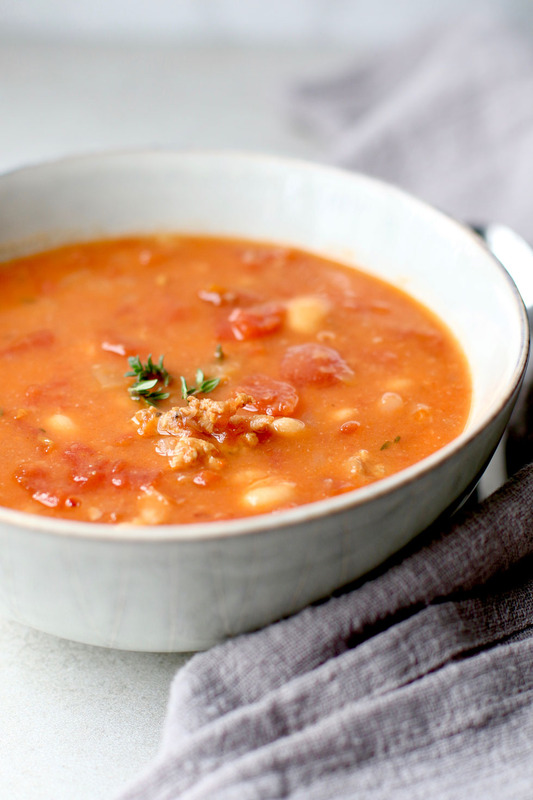 This savory white bean sausage stew is packed with protein, fiber and flavor. Use vegan, turkey, or chicken sausage for a nourishing stew to warm you up on cold nights! I thought I was all done with soups and stews for the winter. No. 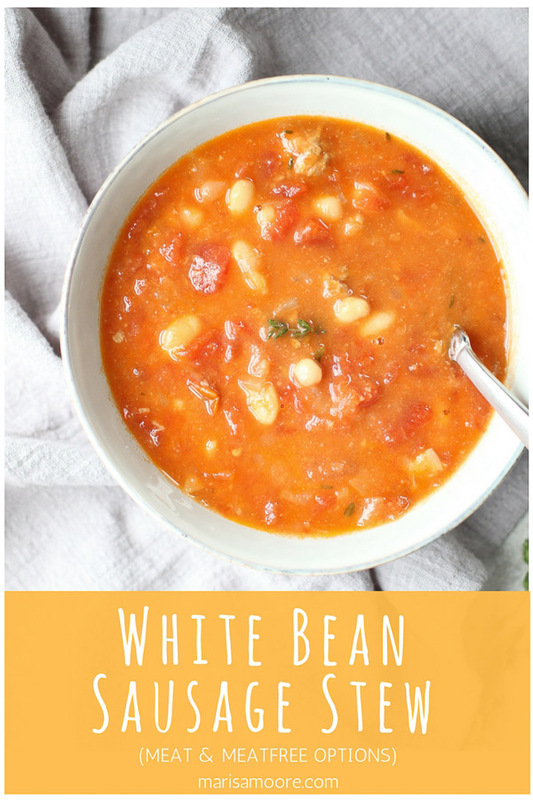 It’s so cold today that I decided to go ahead and share this white bean sausage stew recipe. It may come in handy for the chilly weekend ahead and especially for my friends in the North digging out of the latest snow storm. This stew is made up of foods you probably already have on hand. You can use a good quality vegan or vegetarian sausage, turkey or chicken sausage to add flavor. Just check to make sure it’s made with ingredients you love. You can often find great options made fresh in the store. I first made this recipe in the Instant Pot back in January. It was a cold evening and I wanted something quick, hearty and delicious. 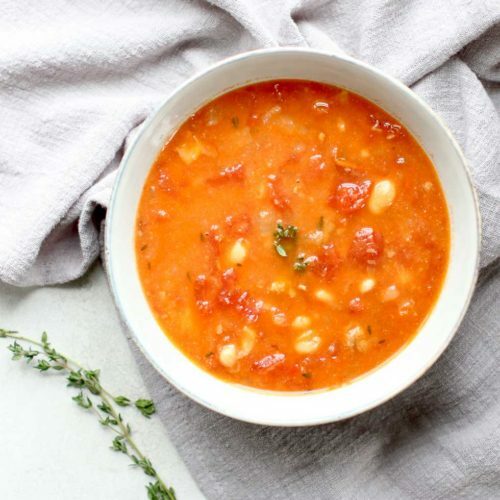 I had dried white beans in the pantry along with a can of diced tomatoes. Though the beans were not soaked, I decided to test them out in the pressure cooker. It worked! If you have an electric pressure cooker, take the same steps listed in the recipe but saute the sausage and aromatics all in the Instant Pot (multicooker) and add the dry beans and other ingredients. Cook with natural release for 20 minutes. 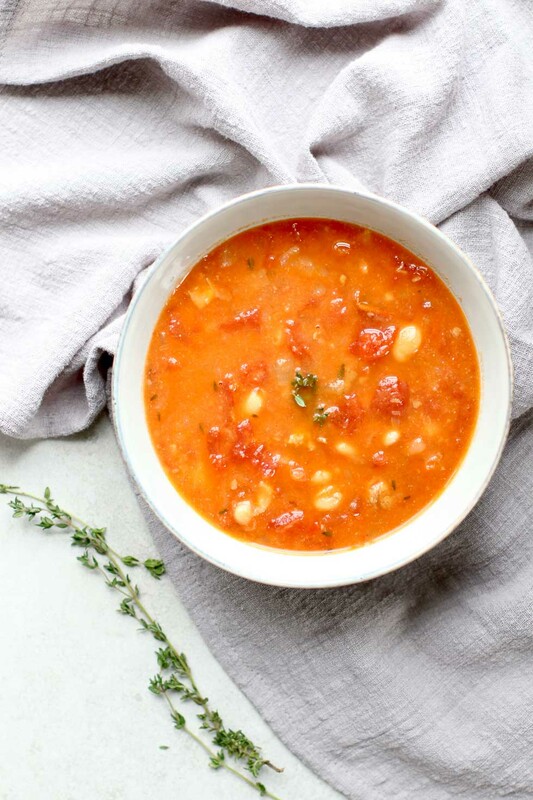 If you don’t have a pressure cooker, I’ve included a short cut on how to make it quicker using canned beans at the end of the recipe. Tag me on Instagram when you make this recipe! This hearty, savory white stew is packed with protein, fiber and flavor. Use your favorite turkey, chicken, or vegan sausage for a nourishing stew to warm you up on the coolest nights. In a Dutch oven or large stockpot, heat 1 tablespoon olive oil over medium-high heat. Add the sausage and cook until browned, breaking the sausage into smaller pieces as it cooks. Remove from the pot and set aside. Add the remaining tablespoon olive oil to the pot. Sauté the carrots and onion until the onion starts to soften. Add the browned sausage, beans, broth, tomatoes, garlic, bay leaf, and thyme. Bring to a boil, then reduce heat to medium-low. Cook until the beans are tender, about 1½ -2 hours, adding additional water or broth if needed. Once the beans are soft, taste and adjust seasoning. Add to bowls to serve. Top with extra olive oil and thyme for garnish. Shortcut: Swap dried beans for 2 cans rinsed and drained Cannellini beans. Cut the stewing time from up to 2 hours to only 20 minutes.